In January, I posted some Incident Response tips on how to deal with a Vista system with Bitlocker enabled. You can read the initial post here. I was recently doing some training and we discussed Bitlocker techniques in depth and decided to post a follow up with some additional tips. 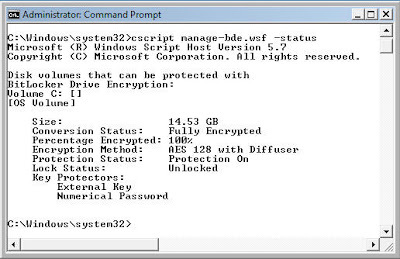 Also, NTFS is the required filesystem on the logical volume encrypted with Bitlocker. This last option tells you that the logical volume "C" is encrypted with Bitlocker and that an external key (USB) and a numerical password are being used as protectors. This tells the investigator that there must be an external USB device with a key on it (.BEK) extension and that there may be a numerical password written down somewhere. The password is very long consisting of eight groups with six numbers in each group, such as: "363319-629200-548735-017523-429363-314292-005962-259380". The status output also tells you if Bitlocker is currently enabled. Once you have determined that Bitlocker is in fact installed and enabled, the investigator now has to decide how to handle this volume so later analysis can be performed. There are a couple of options available at this point. The investigator could use a live response CD and make an image of the logical drive while the system is running. It is important to understand that a LOGICAL image must be taken, because it uses the Windows API in order to obtain the decrypted data. If a physical image is taken, you will end up with a full image of the hard drive in its encrypted state and then you will have to deal with decrypting it later in order to perform an analysis. 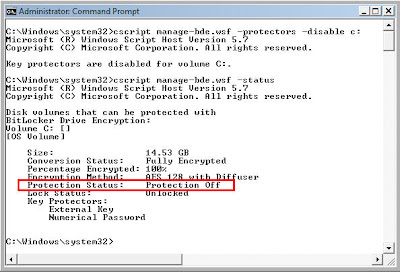 "cscript manage-bde.wsf -protectors -disable c:"
The above command will disable Bitlocker (not decrypt) and if later attached to another Vista machine using a write blocker, all the data will be visible and available for imaging. 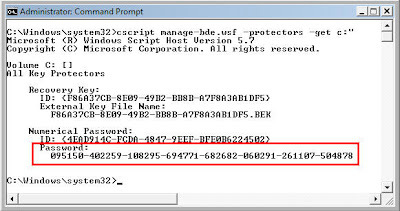 "cscript manage-bde.wsf -protectors -get c:"
EnCase can handle BitLocker just fine. Also, when you disable BitLocker through Vista, the unallocated space will NOT get decrypted! Furthermore the encryption keys get wiped. You are correct, EnCase can handle Bitlocker as long as you have the recovery password or key protector AND you must have the EDS module. When you disable bitlocker NOTHING gets decypted, not unallocated space or allocated space, everything remains encrypted. The only difference is that the key is stored on the drive so that you dont need to present the key from the USB in order to boot. The encryption keys are not wiped, enabling Bitlockler using the same methods I described, restored Bitlocker back to the previous state requiring the USB startup key or recovery password in order to boot the OS. I highly suggest using EnCase, if you have it and the EDS module, but the other techniques were presented as alternatives in case you do not. I meant that when bitlocker is REMOVED so that you can forensically analyze the disk everything but unallocaed will get decrypted and the key blob deleted. You can just analyze/preview the live system. Also, most BitLocker intallations just use the TPM and NOT the PIN/USB modes. Also, when BitLocker gets installed, all the unallocated space (minus 10 GB) gets filled with encrypted 'W'. So these sectors show that they have not been written to since that point! Anonymous, thanks for your comments and observations. A couple of comments: I never recommended REMOVING" Bitlocker since that will severely alter the data and there are other workarounds that will work and there is no reason to decrypt the volume since you can make a image of the decrypted data using other methods. I am not sure what you mean by "you can just analyze/preview the live system?" Are you saying thats all you can do? or are you saying that you can perform an analysis on the live running machine? I concur with your observations of unallocated space. Yes - if you are on a live vista machine, you could just acquire the data from there ( und the acquisition program from a removable disk). Not perfect forensically and you'll have to have admin rights - thanks to UAC. But your description of Vista/Bitlocker is right on and an excellen resource. Sorry for the double post - dunn how that happened. How is it that unallocated space is not decrypted when BitLocker encrypts at the sector level and has absolutely no idea of what sectors are in allocated clusters and those that are not? If you can log into the PC then bitlocker is over. You now can access anything? Right?? Thanks for sharing this informative and useful post with us. Good work.